I would have never understood how incredible Mexico was until I visited myself for the first time this past year. Three months later, I was already ready to call myself a Mexico wedding photographer. When I came back to the US, I began telling everyone I knew about how underrated this country was. If you’re reading this, it’s most likely established that you’ve chosen Mexico as the country you’re going to tie the knot in. First of all, I could not be more excited for you! The next question is, of course, where in Mexico do you choose to get married? With such a variety of locations to pick from, how on earth do you make a confident decision on which town is the best fit to host one of the most special days of your life? Having visited 5 states, I’ve been able to discern with reasonably well-rounded knowledge of the country, a few of the best places for a wedding in Mexico. I have to admit, I have yet to visit the many beautiful beaches in Baja or the wondrous towns like San Miguel De Allende so I wouldn’t call this comprehensive but I know I’m covering a lot of ground with this list. Whether you can count your guests on one hand or are inviting every contact in your phone, here are my recommendations on where to get married in Mexico directly from a Mexico wedding photographer! Not everyone knows the state of Quintana Roo but they’re certainly familiar with the popular destinations the state has cultivated to draw tourists by the millions every year. Cities like Cancun, Playa Del Carmen, and Cozumel are popular places to visit and serve as incredible settings for a Mexico wedding photographer to capture beauty in just about every direction. Considering all the gorgeous places to have a wedding in Quintana Roo, those places are absolutely great choices but there’s one particular place that stands out to me: Tulum. I can’t help but smile when I think about Tulum. It’s a place filled with positive memories and stunning visuals like clear blue water, rich green jungle, and bright white sand. Being a Tulum wedding photographer is an opportunity I couldn’t pass up after spending time there. I can’t imagine shooting a ceremony there and having it not come out looking like an absolute dream. 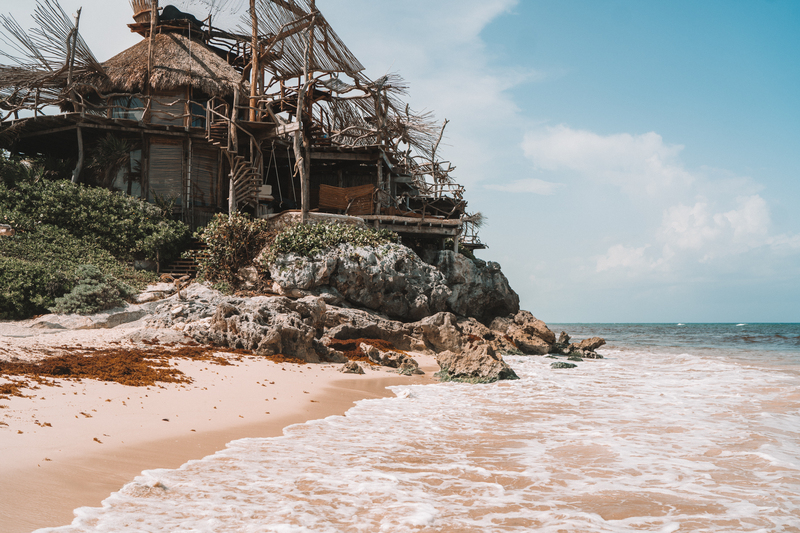 With all the pros of a beautiful Caribbean wedding plus ancient Mayan ruins, inexpensive food, and incredibly designed lodging minus the copious tourism, there’s nothing not to like about Tulum. It’s common to hear from those who have visited Tulum about the feeling of being in another world. To feel separated from problems, as if you’ve truly “gotten away” is one the aspects people look for in a destination wedding. If you’ve already seen enough to know you’re ready to book a Tulum wedding package, check out this Tulum wedding blog for more tips! A Tulum wedding package is right for you if you love bohemian vibes, lush jungle, or beaches with turquoise water. My favorite hotels for a destination wedding in Tulum are Azulik (pictured below), Casa Malca, Be Tulum, and Sanara. Although Tulum may have caused me to start thinking about moving to Mexico, Estado de Mexico solidified it. A place full of history, culture, and life, this state is the most populous out of all 32 in Mexico. I consider Estado de Mexico the best place for a Mexico wedding photographer because of how creative you can be with the variety of different colonias to work in. Estado de Mexico is also inexpensive to fly to and very central, making it a great stop before a trip to Cabo or down to Chiapas. It’s a no-brainer that if you’re to choose this state you should have your wedding in Mexico City. The reason why I became a Mexico wedding photographer is largely due to the wondrous metropolis that is Mexico City. It combines the best of Spanish design and sensibilities with a truly Latin feel to create an urban sprawl with at least one neighborhood anybody could feel like home in. I’d opt for an urban destination for the same reasons someone might choose Los Angeles or New York for their wedding, certain cities just have near-tangible personalties and CDMX (Ciudad de Mexico) is no exception. A Mexico wedding photographer should be able to take the stone walls of the city and transform them into a beautiful backdrop for any bridal portrait. Plus, people in Mexico City know how to party like nobody’s business so if you appreciate dancing until the morning, I’d strongly consider the western hemisphere’s largest city as the place to host your wedding. Choose Mexico city for your Mexico wedding package if you like inexpensive tequila, brimming culture at every corner, and a city that never sleeps. In terms of beautiful options for a Mexico destination wedding, it’s hard to find a better place than the free and sovereign state of Guanajuato. The state is home to several historically important cities, including the popular San Miguel de Allende, Celaya, and the capital where I spent time on my first ever trip to Mexico, Guanajuato. Guanajuato’s average altitude is over 6,500 feet, making mountainous epic wedding photos a must for this location. For a Mexico wedding photographer, the state of Guanajuato is an easy inquiry to say yes to but especially one in the capital city. For a place rich with color, history, and amazing food, I’m surprised by how little I’d heard about Guanajuato before I visited. I cannot wait until shooting a Guanajuato wedding is crossed off my bucket list because I know it would be a day filled with magic. I reserve the use of the word ‘magical’ for only the places that deserve it, being that I see it used to describe seemingly everywhere on Instagram, so when I say Guanajuato is filled with magic I really mean it. There’s something captivating about the town, something about the cobblestone steps that feel stuck out of time or the friendliness of the locals, that makes me so excited to book a Guanajuato wedding package. A place with different colors at every turn means just about every block is an opportunity for phenomenal bridal portraits without tourists crowding the streets like in other more popular wedding destinations. Go with a Guanajuato wedding package for your Mexico wedding if you love rooftop views full of colors, are inspired by daytime walks, and quaint towns. If you’re even remotely considering Mexico as the place to host your wedding, I want to urge you to make the leap and go for it. For those who can’t see themselves going to a place like Tulum, there are other options for a beach wedding less than an hour away. And still, for those who need to be near an ocean when they get married but want to avoid a destination with even a small whiff of touristy resorts, there’s always the Pacific side of Mexico… As a Mexico wedding photographer, I’ll always be an advocate for those who want to go against the grain and choose a place a bit out the ordinary for their special day – and Mexico is extraordinary, to say the least. What I like the most about Mexico is that there really is something for everyone – with the exception of cold environments, Mexico has high-end resort beaches, deserted paradise-like beaches, foggy and crystal-clear mountains, tropical forests, densely wooded forests, and I could go on but I think you get the picture. Being a Mexico wedding photographer is such a joy because of all this variety so if something has jumped out to you or you have questions that need fuller answers, I love to be a resource for all things Mexico wedding-related. Give me a call or fill out a form submission for your unique situation and we’ll have a conversation about your potential (or hopefully definite) Mexico wedding!